St. Louis, MO (January 30, 2018) – Tech Electronics, St. Louis owned technology services provider, announces their partnership with previous Arch Grants winner and emerging leader in security and facial recognition, Blue Line Technology. Blue Line’s Facial Recognition technology is a state-of-the-art camera-based system developed by veterans of law enforcement. 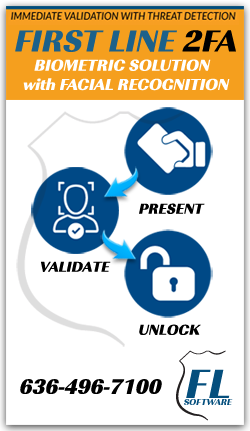 First Line Facial Recognition is designed for threat detection, access control and concierge applications with a robust service distribution across many industries. This partnership allows Tech Electronics to offer its customer base of 18,000 this Facial Recognition technology, becoming Blue Line’s largest value-added reseller. The technology services provider will have the ability to implement, manage, maintain and service Blue Line’s product across all of its nine locations. Tech Electronics is a technology services organization headquartered in St. Louis, Missouri with a network of regional offices in Columbia & Springfield, MO, Bloomington & Chicago, IL, Indianapolis, IN, Topeka, KS, Kansas City, Metro and Denver, Colorado. Since 1963, Tech Electronics has been designing, installing and maintaining a variety of systems and services for institutions and organizations in the government, healthcare, education & business markets. The company specializes in Voice & Data; Fire & Life Safety; Security Systems; PS/AV; IT Services; Nurse Call Systems & more. For more information visit www.techelectronics.com or 314.645.6200. Headquartered in St. Louis, MO, Blue Line Technology was launched by retired law enforcement officers to be an industry leader in both threat detection and access control. Their landmark product, First Line Facial Recognition, uses state-of-the-art technology to monitor, detect and alert users when a threat or unknown subject’s face is captured by the system. For more information, visit bluelinetechnology.com. Call Today for a free consultation and learn about Blue Line Technology and our First Line products. © 2019 BLUE LINE TECHNOLOGY. All Rights Reserved.